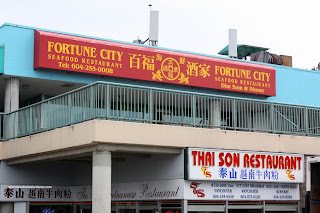 Now fully back into the ChineseBites schedule of restaurants, we made our way to Fortune City for dinner. 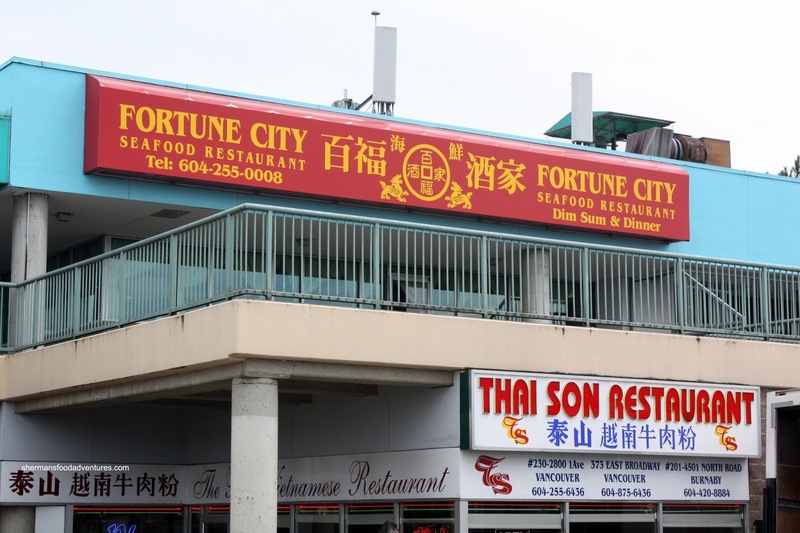 I've been here before for Dim Sum and it was frankly quite mediocre. Hence, my expectations for dinner were not high. However, with anything, I went into it with an open mind. As per usual, the ChineseBites crew were there including Rick, Alvin, Kevin, Grace, Sean, Amy and Romina. 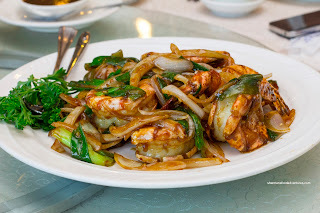 We started with the Pan-Fried Tiger Prawns which were wok-tossed with green and white onions. Hence, the flavour profile was quite sweet and of course "oniony". The prawns themselves were cooked right having a firm snap while exhibiting a natural sweetness. Of note, I found the dish to be rather heavy on the grease. 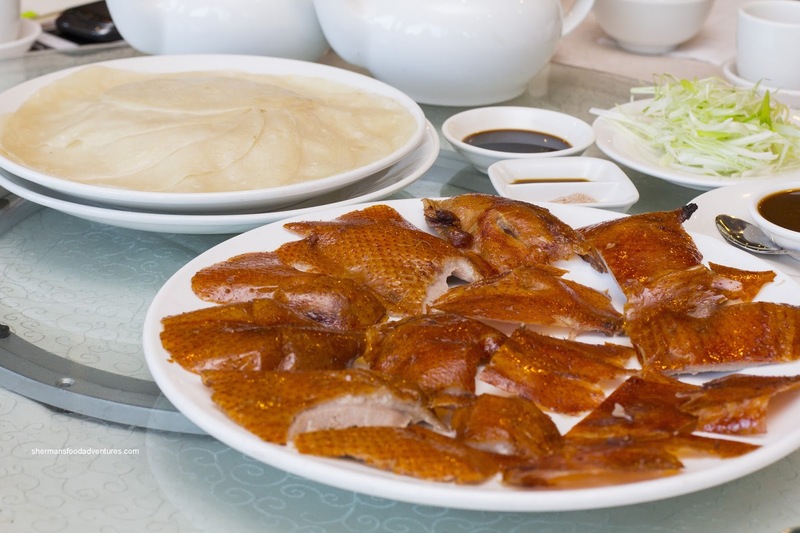 Next up was the whole point of the meal - Peking Duck. 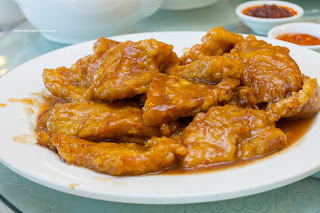 You see, for all the ChineseBites dinners we've had, Peking Duck has never been on the menu. For the first course, the Peking Duck wrap was pretty good. 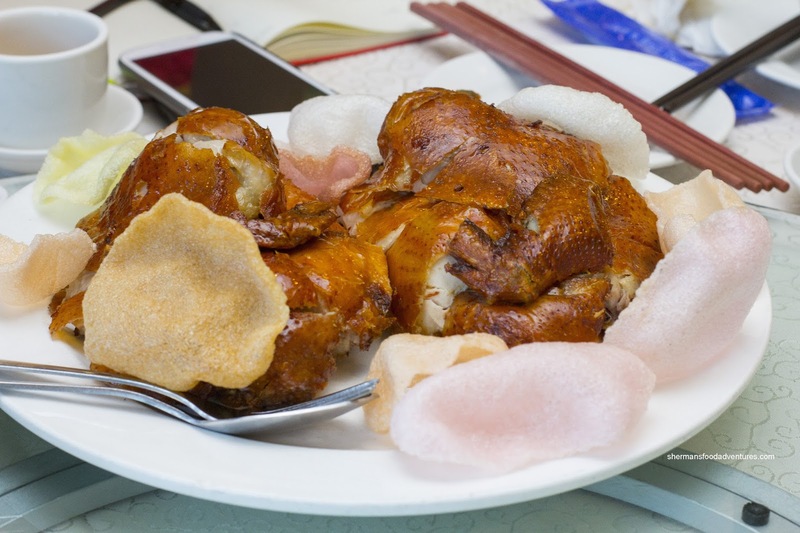 With a beautiful hue, the duck skin was crispy and light. The layer of fat was minimal whereas the meat was moist and tender. I particularly liked the noticeable roasted flavour. The crepes were so-so in my opinion as they were a little thick and chewy. At the very least, they were not dried out. The second course was the standard Duck Lettuce Wrap. There was ample amount of the same moist duck in the stir-fried filling. I found it to have enough moisture without being wet. 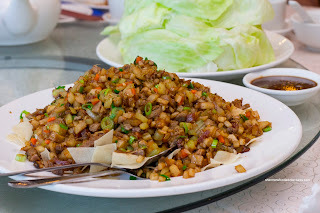 There was a good level of crunch from the veggies while the addition of diced Chinese sausage made for a slightly different flavour as there was an increased savoury and aromatic element. From that, we had the Sauteed Ling Cod with Yau Choy. The fish was oil-blanched properly where it was intact, moist and flaky. They were not overly aggressive with the seasoning which was a good thing due to the delicate fish. 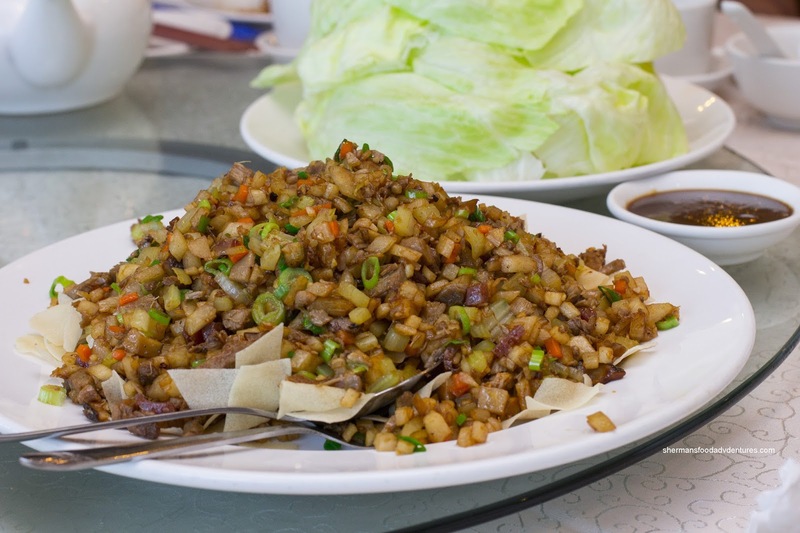 As for the yau choy, it was overcooked where it had lost most of its snap. 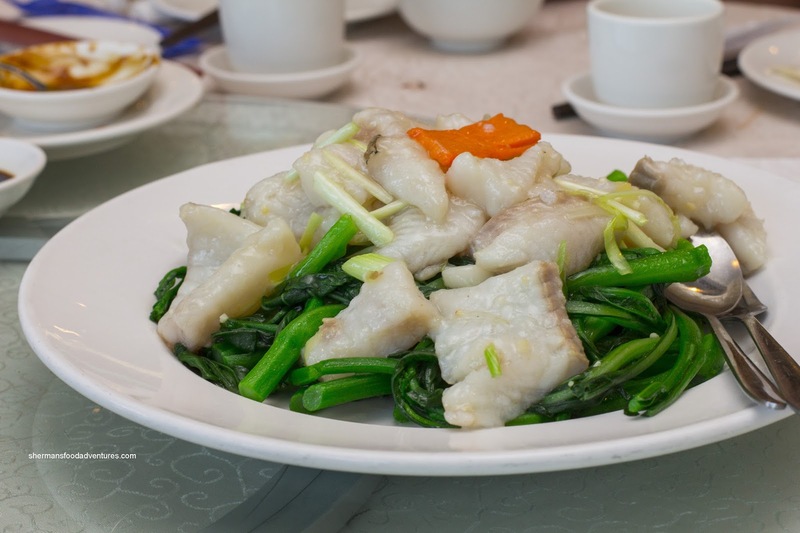 Due to the conservative use of salt, the yau choy was subsequently bland. Back to some more crispy skin, we had the Deep Fried Crispy Skin Chicken. 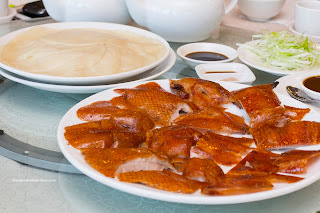 Much like the Peking Duck, the chicken skin exhibited a beautiful shade of golden brown. I liked how the fat was nicely rendered. As for the chicken itself, the dark meat was juicy and flavourful. On the other hand, the white meat was a bit dry. A bit more of a brine might've helped matters. Then we had something a little bit different with the Pork Chop in Plum Sauce. With the massive amount of sauce, the pork chops were a bit soggy. However, at the same time, they were super tender. I liked how there was a minimal amount of fat too. As for the sauce, it was tangy and quite sweet. Moving along to Rick's favourite dish (he didn't like the one at Golden Swan), we had the Braised Egg White and Crab Meat with Broccoli. 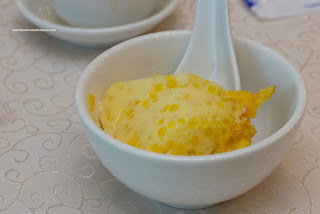 This one was better, but I got big chunks of thickened corn starch which were not appetizing. If we looked beyond that, the egg whites were fluffy and lightly seasoned. There was a good mix of crab leg meat, crunchy shrimp and baby scallops mixed in. I found the scallops to be a bit fishy though. The broccoli underneath was vibrant and still crisp. 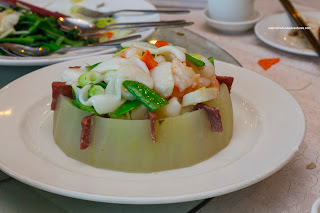 Nicely plated, our last dish was the Wintermelon with Assorted Seafood. The melon was super soft with pieces of Virginia ham adding some flavour. 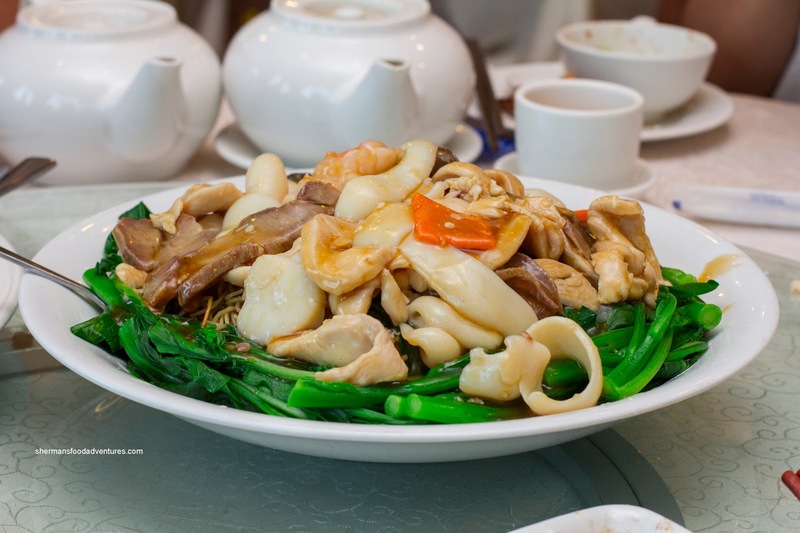 The stir-fried seafood was of scallops, prawns and squid were cooked properly with the squid being the highlight It was tender while maintaining a nice chewiness. If this wasn't enough food already, we were presented with a random dish being the Special House Chow Mein with lots of the same ingredients as the previous dish (add BBQ pork, chicken and mushroom). Toppings were fine and so was the sauce, but there was too much of it rendering the noodles into a greasy mush. Normally, there are crunchy bits, but everything was wet. Overall, the meal was okay, but not without some execution issues. The dinner pretty much mirrored my mediocre Dim Sum experience. 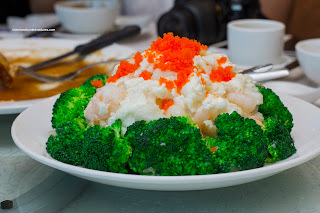 Judging from the pics, everything looks pretty good except for the winter melon dish. Will definitely keep it on my radar.